Looking for information on soybean production in North Carolina? Staying on top of all the latest production practices and research can be overwhelming. The Grower Resources Portal provides you with access to expert information and news about soybean agronomics in North Carolina. Resources include blog articles by NCSPA staff, handouts, links to NCSU information, and other important soybean production websites. Explore the resources we have provided below and come back often for the latest soybean production information! 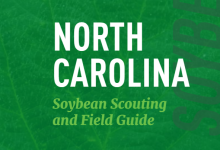 The North Carolina Soybean Producers Association in collaboration with North Carolina State University created a NC Soybean Scouting & Field Guide to provide farmers with brief descriptions and photographs of pest species and problems common in North Carolina. Decision calculators, weed profiles, & mode of action charts. Fungicide efficacy, disease profiles, & rust monitoring. Threshold calculators, insect profiles, & management tips. Soil testing, nutrient recommendations & deficiencies. Planting dates, row spacing, seeding rate, & seed treatments. Yield, performance, & disease resistance of NC varieties. Basic soybean info, tillage, and cover crops. Harvest aids & harvest, storage & drying tips. NC cash prices, & soybean production budgets.